PATUXENT RIVER, Md. --- Members of the flying control and flight deck control teams aboard HMS Queen Elizabeth (R08), flagship of the Royal Navy’s new class of aircraft carriers, visited Naval Air Station Patuxent River, Maryland this week for their first live peek at the F-35B Lightning II, ahead of the jet’s first trials aboard the ship this fall. On Tuesday, about 20 members of the HMS Queen Elizabeth team witnessed F-35B test aircraft BF-02 and BF-04 taxi, perform two vertical landings apiece, and conduct a couple short takeoffs. The ground reverberated as each aircraft approached the tarmac for its vertical landings led by the F-35 Pax River Integrated Test Force team, hovering for several seconds prior to descending. The next day, the Ship’s team took over and, acting as landing signal officers, taxied an F-35B for the first time. Persistent rain limited the team’s activities on Thursday prior to their Friday departure back to the United Kingdom. 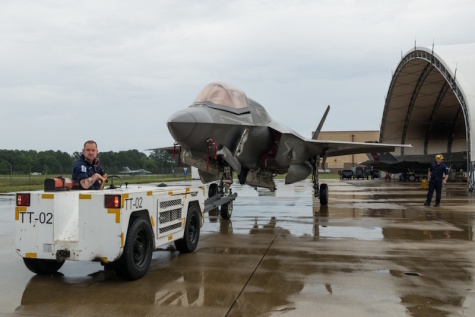 In terms of getting his personnel familiar with the F-35B, prior to this fall’s ship trials off the U.S. eastern seaboard, the trip was a success, said Royal Navy Cmdr. James Blackmore, Commander Air aboard HMS Queen Elizabeth. “It’s the first time they’ve ever seen the jet or been up and close to it as it’s performing its flight maneuvers, so they got to feel the environment of what it’s like, the sort of noise, the heat, the sound and the pressure of the aircraft, so that when it comes to deck for the first time, it’s not a surprise,” Blackmore said. As HMS Queen Elizabeth’s “air boss”, Blackmore is in charge of all aviation activity onboard a ship “that’s been designed specifically for the F-35,” he said. At roughly 65,000 tons, HMS Queen Elizabeth is much smaller than U.S. Navy carriers, but its flight deck and hangar are about the same size, Blackmore said. He noted the “key difference” between the two nation’s aircraft carriers is the Queen Elizabeth class’s flight deck, which is designed exclusively to handle helicopters and the F-35B, the short take-off and vertical landing (STOVL) variant of the fifth-generation fighter. “From the keel up, it’s all been about F-35 from day one,” he added. For the U.K., the F-35B represents a much-anticipated return to carrier aviation, one that holds particular significance for Blackmore, who piloted the last Harrier flight off the HMS Ark Royal, the U.K.’s last aircraft carrier, in November 2010. Equally fitting, the Ark Royal’s Captain at that time, Commodore Jerry Kyd, is now the Captain of HMS Queen Elizabeth. “The fact that’s it’s F-35 is pivotal, because you’re in the fifth-generation game now with aircraft, which brings stealth, sensor fusion, advanced weapons and the ability to project aviation and power ashore at your choosing,” he said.